This Presentation date is September 13, 2018 at 15:00 - 17:00 local time. 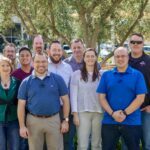 Chris Hinsz, Director, Product, provides an overview of Fortinet’s history and why wireless is important to the company. Chris Hinsz, Director, Product, looks at how wireless networking has become about more than just Access Points putting out RF energy. This session foes over the pieces of Fortinet’s offering for planning, deploying, and managing a wireless network. Koroush Saraf, VP, Product Management, reviews how as we are entering into the 3rd generation of network security, integration of the access layer with network security provides stronger security with simplified management. Koroush Saraf, VP, Product Management, provides a live demo of a compromised device being automatically quarantined by the infrastructure using FortiGate. Koroush Saraf, VP, Product Management, review that while location analytics are traditionally though of as a retail need, it has value in a number of situations. 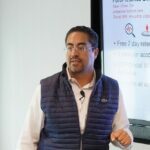 Koroush looks at Fortinet’s analytics solutions and a customer use case highlighted with examples of how this extends to multiple verticals. Ted Fornoles, Product Amangement – WLAN Products, goes over the basics of how Virtual cell works and what the benefits can be.